Paul wants to know what Chrissie is doing, Chrissie says she was trying to find out more about Isabella, she doesn't trust her. PAUL: If you don't start showing some respect to Isabella, you can get out. Chrissie says Paul is so besotted that he can't see what Isabella is like and she runs off in tears. Helen is tired from working on her own, Dorothy invites her for a meal but it can't be tonight as she has another date, she is going to give up if her next 2 dates don't go well. 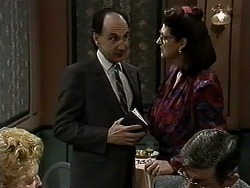 Adam arrives for some food just as a customer is asks for his order; Helen gives it to him with a stern look! Caroline tells Chrissie to be nice to Isabella, Chrissie says that Isabella isn't as nice as everyone thinks but she promises to try and be nicer to Isabella. The phone rings, it's Isabella's Mother, Caroline goes to get Isabella while Chrissie decides to record the conversation using Paul's Dictaphone. Another customer complains about the food and leaves Helen in an empty shop; she sits down and puts her head in her hands. Chrissie is here to see Adam, he wants him to translate Isabella's phone conversation, Adam isn't sure as it's a private phone call, he agrees as long as it's a one-off. Dorothy is on another date but then another one turns up, she has double booked herself, and the two guys decide that they should have dinner together! Also, they are both called John! As they have dinner they discuss the dating agency they have been using, the two John's compete for Dorothy's attention with lots of flattery. Paul and Caroline are bored at a function so they have escaped to the office. Caroline says that she asked Chrissie to be nice to Isabella. CAROLINE: She can be a bit tactless. 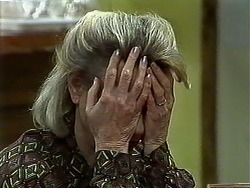 The phone rings, Jim wants to know where Helen is but Paul and Caroline haven't seen her. They decide to check The Coffee Shop. 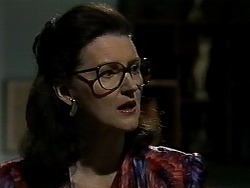 MAURICE: I scored you an ‘89'; we must go out for dinner again. 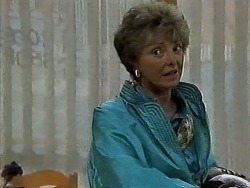 DOROTHY: I'm sorry but I will have to say no. You were too busy adding up my score to take notice of my score for you. I wrote on your report card ‘must try harder'. Paul and Caroline check out The Coffee Shop, the door's unlocked so they go inside, it's dark and Helen is slumped at a table asleep. Paul wakes her up and tells her that they will take her home. Adam hasn't found anything interesting but when Chrissie reads the transcript she discovers that Isabella talked about having a husband! Chrissie is delighted that she has some dirt on Isabella. Chrissie returns home, Isabella is alone; she tries to be friends with Chrissie. CHRISSIE: I tend to be friends with people who are honest and you are not honest! Chrissie asks about the husband, Isabella says she was married a very long time ago and it's now over, Chrissie thinks she is lying. Isabella wonders why she wants Paul to suffer. CHRISSIE: I don't, I'm trying to save him. 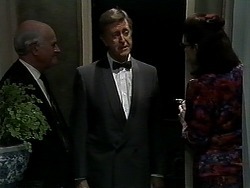 The two Johns arrive home with Dorothy, one leaves and the other stays for coffee, he looks rather pleased with himself after Dorothy says she has a little extra something for him. Helen arrives home and insists she will not quit the shop, Paul wants to get her some help but Helen doesn't want to, she says Gemma can do a few more hours. Paul wants to get someone from Lassiters to help her, Caroline agrees that it is a good idea; Helen tells them that she will decide tomorrow. Paul and Caroline leave after telling Helen to go to bed. Dorothy returns with coffee and the extra little something are some cakes but John has taken all his clothes off and gone to the bedroom! 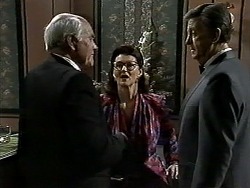 Paul and Caroline arrive home; Chrissie makes Isabella confess about her ex-husband. Chrissie admits she taped the telephone conversation, everyone is shocked. Paul announces he is buying the house from Gail and when it is completed the twins have to move out. PAUL: …Chrissie's actions have left me with no other choice.